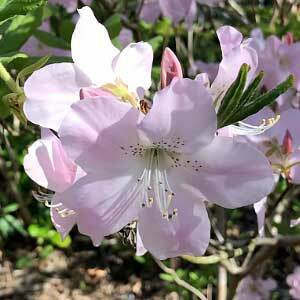 A free flowering understory shrub Rhododendron schlippenbachii is commonly called the Royal Azalea. Masses of fragrant soft pink flowers in mid spring make this a great plant for a shaded position in the garden. Rarely offered for sale as it is a little difficult to propagate, this is a species that will flower earlier than other deciduous types. Autumn colour is best described as Alizarin crimson or bluish red. This is a deciduous speeches that naturally occurs from Japan, the Korean Peninsula through to Russia. Being an understory plant Rhododendron schlippenbachii appreciates shade, it grows well beneath large deciduous tree near the drip line. A humus rich well mulched soil is important. Add good amounts of well rotted compost and a little aged cow manure. Mulch around the plant with good amounts of organic mulch each year. Generally not required expect for removing dead or damaged wood. Propagation is possible from seed however it will take many years to obtain a flowering sized plant. Cuttings are possible, however difficult to obtain good strike rates. Layering is an effective method for many growers. 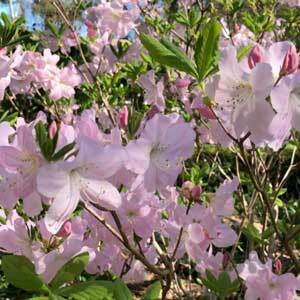 Common Name – Royal Azalea. Soil – Well drained moist soils. Height – To around 2 – 3 metres. Spread – To around 2 – 3 metre. Flowers – Pale pink to white.